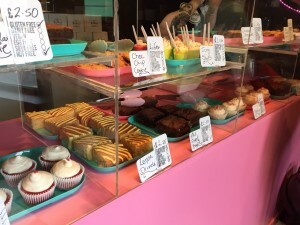 Sugar Daddy’s opened last yesr and has already been selling out of stock – all of which is gluten free and much of it also vegan. The Bakery at the moment is only producing cupcakes and traybakes, but it is a good start. In the spirit of research I visited this week to see what all the fuss was about. The decor of the shop is terrific, sort of 50s diner meets burlesque theatre. With lights, colour and a tiny bench where you can enjoy coffee and a cake, a lot of thought has gone into the look and feel of the place. And with The Friendliest people running it, they are definitely heading for success. Check out the website at: www.sugardaddysedinburgh.com as there are cake decoration classes with a unique twist! I bought a selection of cakes for my office to try out, on the assumption that the gluten eaters are the best critics. There is a fair choice on offer. We had four cupcakes: red velvet; death by chocolate; vanilla; and fudge; and of the traybakes we also tried the peanut butter brownie, which is clearly very healthy and low calorie. The comfort of a fully gluten free kitchen with no worry of contamination, is a great thing. If I am honest, I do not feel the need to eat vegan food and I actually really like baking and particularly icing, that is made with good quality butter and eggs, but if you are seeking out treats that are both gluten free and vegan, look no further. I hope very much that this venture does succeed. With more and more people being diagnosed as coeliac or gluten intolerant, the need for care and attention in food production is important. The key is going to be in producing a quality product that stands up to the “normal” product and keeping it varied. I suppose I am slightly uneasy about the logo and the name of this shop, with all its connotations. However, a good brand has standout and memorability and with so many cutesy, china and chintz bakeries in Edinburgh, something so daring will achieve that.